Thaiesha Wright is a senior Chemistry major at Spelman College. Thaiesha conducts research during the academic year at Spelman under the mentorship of Dr. Leyte Winfield. Her current research focuses on synthesizing benzimidazole derivatives to improve chemotherapeutic treatment for individuals with various cancers. In addition to conducting research at Spelman College, Thaiesha has also conducted research at the University of Arkansas for Medical Sciences. At the University of Arkansas, her research focused on examining Rab6-depleted cells. Through her research experiences, Thaiesha has found that her specific research interests is organic synthetic chemistry. 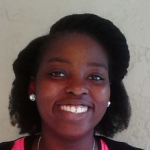 Thaiesha has received a research presentation award in the field of Cancer Research at the 2015 national ERN meeting. She has also won first place at the 2014 Spelman College Research Day for a computer science oral research presentation. After graduating from Spelman College, Thaiesha plans on entering into a competitive PhD program in either organic chemistry or biomedical science. Her ultimate goal is to enter into academia, serve as a primary investigator for her own lab, and create a less invasive chemotherapeutic agent.